CBSE Syllabus For Class 8 Social Science: CBSE Social Science includes three sections – History, Geography, and Civics. The CBSE syllabus for Class 8 History mainly deals with the history of Modern India, i.e. post the revolt of 1857. Having a good knowledge of History of India will help not only in your annual exam of Class 8 but also in various competitive exams for admission to top institutes as well as jobs, in the future. Likewise, having knowledge of Geography with a focus on Indian Geography and Civics will also be immensely useful. CBSE syllabus for Class 8 Geography, basically, deals with the geography of India, and CBSE syllabus for Class 8 Civics deals with the social and political life in India. 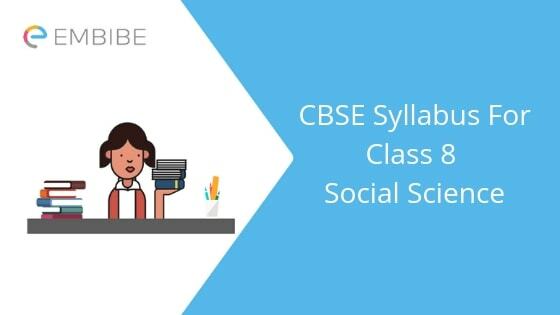 In order to study and learn everything, students must have a clear knowledge of the CBSE Syllabus for Class 8 Social Science, for all three sections. In this article, we will provide you with all the necessary information regarding CBSE Syllabus for Class 8 Social Science. Read on to find out. The CBSE Syllabus for Class 8 History is as under. The names of the chapters are listed here. Now you have a clear idea about CBSE Syllabus for Class 8 Social Science for all three sections – History, Geography and Civics. Finish the whole syllabus. As you will have to memorize and remember a lot of information, it is advised that you make notes as you study. Jot down the important points. You can also highlight important points in your NCERT textbooks of Class 8 History, Geography, and Civics. This will make it easier for you to revise. With this detailed knowledge of CBSE Class 8 Social Science syllabus, your preparation will now become easier. Class 8, as mentioned above, should be taken seriously. All concepts and topics in the CBSE Class 8 Syllabus for all subjects must be thoroughly finished. At Embibe, you can solve CBSE Class 8 practice questions and take CBSE Class 8 mock tests for Science and Maths. These will prepare you not only for your annual exams but also other competitive exams, like Olympiads. Make the best use of these resources. We hope this detailed article on CBSE Syllabus for Class 8 Social Science (History, Geography, and Civics) helps you. If you have any question, feel free to drop a comment. You can also ping us through our Live Chat Service where we are available from 10 am till 11 pm. We will be glad to help you out.